The Freshest, The Tastiest Spices anywhere! Chef Leo enters its Third Decade of Happy Customers! You have watched Chef Leo from coast to coast demonstrate what he referred to as his potatoe peeler. You watched him peel potatoes, make french fries, peel apples, squash, cucumbers, rutabagas, carrots, corn ears and anything else that stood still long enough for him to peel. You know how a easy pull of the high carbon steel blade makes all peeling jobs so easy! Well here they are and at a new lower price. Made in Switzerland of the finest metals in the world. 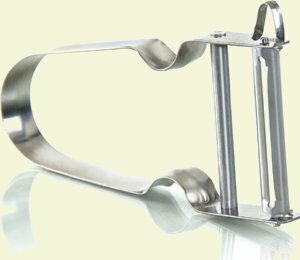 Handle is made of stainless steel and the blade is high carbon steel, for easy peeling and long life. You need more, you have to give them away or use them for useful presents! Get a 3 pack to go and save even more! 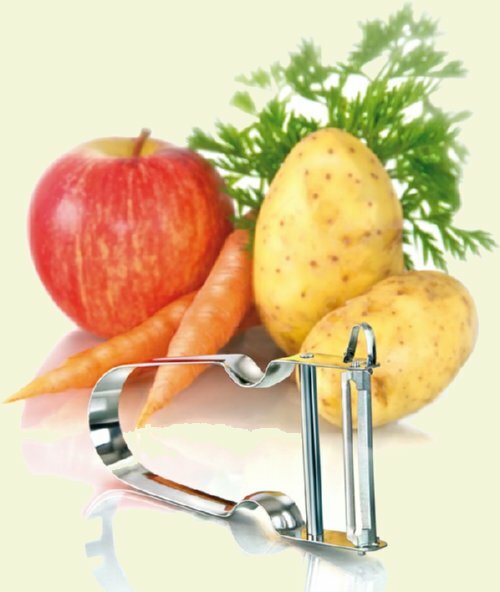 When using the Chef Leopeeler less pressure is always better. Easy peeling is always in the wrist action and easy pulls to peel off that outer skin! Let the blade do the work. Use the V shaped blade end to quickly cut the eye (spots where new growth is beginning) out of potatoe's as well as make french fries in a jiffy! Happy peeling! Chef Leo's, Chef Leo, and all material on this site, (as well as brochures, catalogs and all printed material) is the exclusive property of Chef Leo's Products, a division of Tickbite Supply Company, And are all Trade Marked and or Copyrighted and protected from use by Law Including but not limited to Logo's, Product Names and Images. E-mail davistarr@aol.com for permission to use the material in any form.